The pimento tree is indigenous to the Caribbean Islands. It was found growing in Jamaica by early Spanish explorers who were quite impressed with the taste and aroma of the berries and the leaves. Pimento trees were later discovered in Cuba and were presumed to have been taken there by migratory birds which had eaten the berries. They have also been found in Mexico, but it is Jamaica that has the longest history, having been in continuous production since the tree was identified in about the year 1509. The name Pimento originated from the Spanish word "pimienta" (pepper or peppercorn). To most English speaking people the tree is called "pimento" and the berries "allspice". 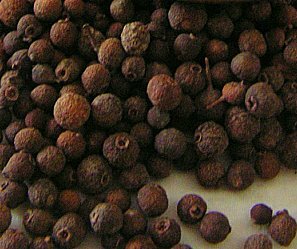 The name allspice originated from the popular notion that the pimento berry contains the characteristic flavour and aroma of cloves, nutmeg, cinnamon and pepper, all combined in one spice. 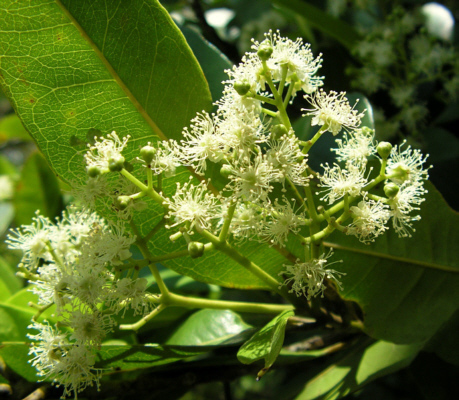 The pimento tree, Pimenta dioica, formerly officinalis, Lindl., belongs to the family Myrtaceae and is closely related to the Bay Tree and to Cloves. It is an evergreen tree, medium in size and in favourable locations will attain heights of from 6 to 15 m. Primary branches are generally formed about 1-3 m above the ground. Whilst both male and female varieties will produce blossoms, it is believed that only the blossoms of the female mature to give berries. 1601 Earliest reference of the use of pimento in London. 1611 Population estimated as 1500, including 74 taino and 523 spaniards and 588 slaves. 1721 Pimento was first listed in the London Pharmacopoeia. 1761 Prices in London were between 6.25-9.25 pence/pound. Litchi, Turmeric, Rose-Apple and Date Palm introduced. 1797 Exports of coffee to Britain nearly 7 million lbs. 1863 Castleton Gardens started. Toll gates abolished. The largest quantity of pimento produced 11,147 metric ton. 1980 Smallest quantity of pimento produced, 888 metric ton. 2006 Export of pimento products estimated at US$5 million annually. At the end of the nineteenth century, it became fashionable to have umbrellas handles made of pimento. The great demand led to wanton cutting of the saplings and it was only through strict controls legislated in 1882 and equally strict enforcement of them that saved the young pimento trees from disappearing altogether. Pimento is the major spice produced in Jamaica, and Jamaica is still one of its' chief producers. The quality of pimento is rated by the amount of oil it contains and the composition of the oil. 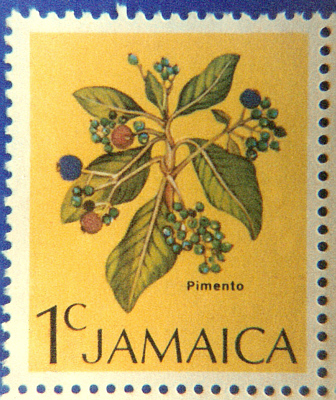 Jamaica pimento contains about 4% volatile oil and the eugenol content varies from 30-90%. The following sensitive map is a simulation of a GC/MS and represents one of the earliest examples of an interactive Chemical-MIME display on the Web. It used the MDL Chime plugin and required the user to be running Windows. Selecting a region of the chromatogram would download the GC and selecting a numbered box would download the MS for that constituent. The GC in JCAMP-DX format can be viewed directly using this link. A more recent set of examples using a JCAMP-DX display of a simulated GC either with JSpecView vs 1 and JSpecView vs 2 and Jmol have been produced as well. FEMA code = (Flavour and Extract Manufacturers' Association of the USA). In pimento leaf extracts, the ratio of methyleugenol to eugenol is generally found to be 15:85. Eugenol is also available from Oil of Cloves where the oil content is 10-13% and the eugenol component is generally between 70-90%. An alternative display of the GC which when clicked will automatically display the molecular graphic and the Mass Spectrum of that component has been developed using JSpecView and Jmol. Other spectra recorded and available in JCAMP-DX format for eugenol (from pimento oil) include an IR, H NMR and a C NMR. An IR spectrum of neat pimento oil is available for comparison, again in JCAMP-DX file format. "PIMENTO - A short economic history" by D.W. Rodriquez and published by the Agricultural Information Service, Jamaica 1969. "Historic Jamaica from the Air", by David Buisseret, Ian Randle Publishers, Kingston, 1996. Another useful source is "The Book of Spices" by F. Rosengarten, Jr. Livingston Publishing Co., Wynnewood, Pennsylvania, 1969. Return to links to the chemistry of other Jamaican items, including bauxite, coffee, spices and fruit and vegetables. Copyright © 1994-2014 by Robert John Lancashire, all rights reserved. Created November 1994. Links checked and/or last modified 12th November 2014.